Facebook said it removed the adverts because they misused its corporate logo. It said it restored them to help “robust debate”. Ms Warren responded to the removal of the adverts in a tweet saying Facebook’s ability to “censor” what people saw was a good demonstration that it had too much power. 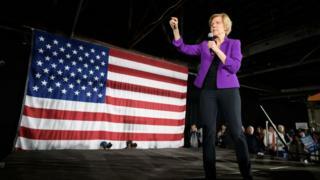 Last week, Ms Warren said it was “time to break up our biggest tech companies” and added that the move would “restore the balance of power” in America’s democracy and promote proper competition in the tech sector. Facebook, Google, Amazon and Apple would all be targeted in the break-up effort, Ms Warren’s campaign office has said. There are strict rules governing who can use Facebook’s corporate logo. These were brought in to stop advertisers using them to make marketing material look like official communications from the social media platform.